One of a set of black and white photographs based on my colour originals and enhanced / converted into mono by Kevin Green (you can contact him at www.freelancebloke.co.uk). 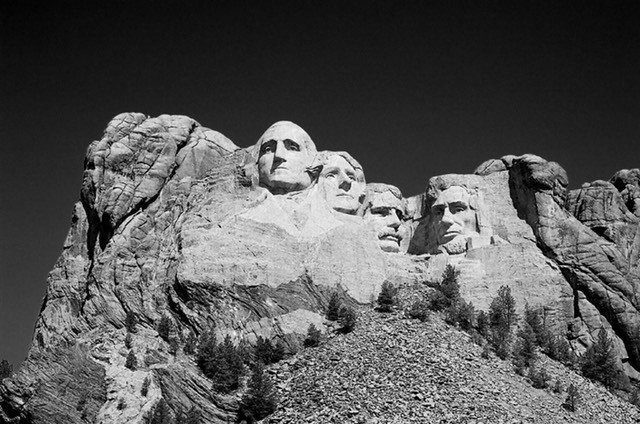 This one is a black and white photograph of Presidents Washington, Jefferson, Roosevelt and Lincoln carved into the mountainside at Mount Rushmore, South Dakota. Other photos in this set include Aguereberry Point, Death Valley; Beartooth Highway, Montana; Courthouse Towers, Arches National Park, Utah; Guadalupe Mountains, West Texas; Interdune Flats at White Sands National Monument; localized storm over the desert in New Mexico; Mesquite Flat Sand Dunes, Death Valleya; Ripple in the sand at dawn, White Sands; two people walking across Bonneville Salt Flats, Utah.